The ski resort of Tremblant is one of the most easily accessible North American resort for skiers from the UK. Immersed in the culture of Canada's French speaking province, Quebec, this vibrant, purpose-built resort is traffic free with a colourful array of charming boutiques. Tremblant is consistently voted best Eastern North America Resort. Tremblant has its own dedicated beginners area on the South Side of the mountain and with two magic carpet lifts, beginners will feel comfortable learning to ski during their ski holidays in Tremblant. The long 6kms Nansen trail, from the top of the mountain, is the perfect way to get that ´top-of-the-world’ feeling early on in your ski career. Intermediates on a ski holiday in Tremblant are spoiled for choice with 45% of the mountain so designated, and easily accessible from the impressive lift network. Don't miss the chance to cruise down runs like Beauvallon, Ryan and Devil’s River on your ski holidays in Tremblant. Once you’ve found your legs on the intermediate slopes, ample advanced terrain awaits you on your ski holidays in Tremblant. There are plenty of diverse and challenging runs on both sides of the mountain. Try out your skills on runs like The Edge as well as the Flying Mile Express and Dynamite, renowned for its steepness. Tremblant has one of the largest snowboarding areas in Canada, so boarders are well catered for. Freeriders have plenty to explore with trees and powder in the Emotion area. For riders who fancy a bit of a jump, there is a well-maintained snowboard park with music rocking into the night and the biggest half pipe in Canada. 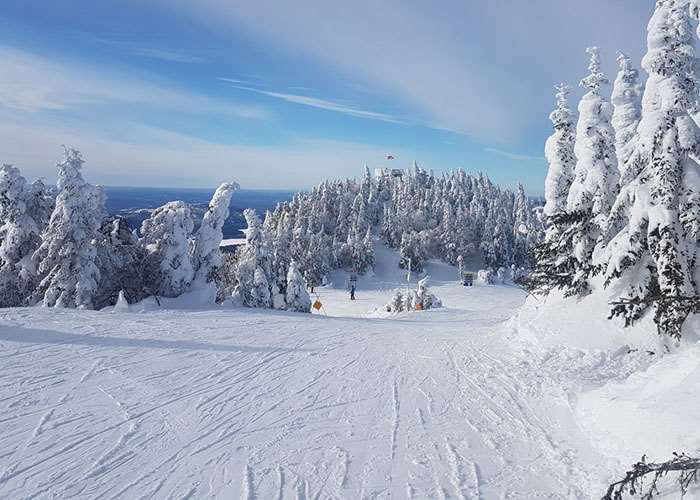 Tremblant ski area is around 35 km driving distance from Mont-Tremblant International Airport and is only a 90 minute car journey from Montreal Trudeau International Airport. Fantastic snow! Skiing in -24 one day proved challenging. Excellent ski-in, ski-out accommodation. Good choice of cuisine and self-brewing beer house made for lots of good evenings! 7 hour flight time made reasonable access, especially for Canada. I will certainly return again in future. Tremblant is perfect for famlies and couples looking for great skiing but quieter nightlife. There are lots of nice restaurents to suite most budgets. A bucket lift runs accross the resort, so accesss to the lifts is good, where ever you stay.But if its nightlife you want, look elsewhere!